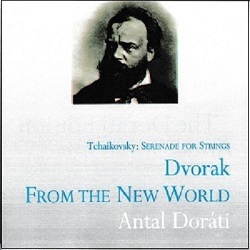 Among the many fine recordings which he made, first for Mercury and later for Decca, Antal Doráti’s way with Tchaikovsky was always well worth hearing but his recordings of the symphonies, on two 2-CD Mercury reissues, or one 5-CD set, with fillers, now seem to be obtainable as downloads only. This 1958 recording of the Serenade for Strings is otherwise available only on an inexpensive Presto 2-CD set, licensed from Universal, with Doráti’s classic LSO recording of the complete Nutcracker (4327502)1 or as part of a monster 51-CD box set (Mercury Living Presence Collector’s Edition: 4783566). The same LSO Nutcracker is also available on a Decca Duo, with highlights from Sleeping Beauty and his later Concertgebouw recording, with Suites 3-4, also remains available (Philips 50). So the Doráti Edition reissue is particularly welcome, joining earlier releases of the Minneapolis (mono) Sleeping Beauty and Nutcracker recordings from the same source – review. The Serenade receives a loving performance and I enjoyed hearing it. It’s not the only way to perform this work and I thought it just a little light-weight in places. I remember hesitating between this recording and one recorded for HMV by Sir John Barbirolli a few years later (ASD646) and, like the Doráti, originally coupled with Arensky’s Variations on a Theme of Tchaikovsky, a most appropriate coupling, though far less generous than we now have on ADE048. Barbirolli was never one to downplay the emotion, as demonstrated by the fact that his recording of Elgar’s Introduction and Allegro is still the one to go for. Of course, Barbirolli could sometimes overdo the emotion – I’m not allowed to play his recording with Jacqueline du Pré of the Elgar Cello Concerto at home for that reason – but he wrung just enough and not too much out of the Serenade for Strings and the Arensky to make me prefer him to all then-current competitors. Alas, I can’t point you to anywhere to make a comparison: even the EMI Forte twofer on which the Arensky was reissued has been deleted, but I suspect that if it were available once more, that would still be my preference. It’s not a matter of tempo – neither Doráti nor, from recollection, Barbirolli rushed matters – but I do wish that Warner would make that HMV recording available again. Memory sometimes plays us false, but not, I think, in this case – that LP is still there as the benchmark in my subconscious. The new transfer of the Doráti offers sound to match the performance – less flamboyant and with somewhat less pin-point placing of the instruments and a slightly narrower sound-stage than we usually expect from Mercury recordings. Having already recorded the New World Symphony for Mercury, with the Concertgebouw Orchestra, c.1960, not wholly successfully – now reissued on Australian Philips Eloquence – Doráti recorded it again with the RPO. I don’t recall there being a UK release of this – presumably it was issued on the budget Vox Turnabout label to avoid competition with the Decca Phase 4 recording which he made with the Philharmonia about the same time (now in a 6-CD Phase 4 collection, Decca 4787662 and in a 40-CD monster box). I had not thought of Doráti as a Dvořák specialist, though his recording of the Cello Concerto with Janos Starker is something of a classic, albeit in a strongly competitive field, and the budget Double Decca twofer with his complete Slavonic Dances, etc., is well worth hearing. With such strong competition, this RPO New World would not be my first choice – of many that I could name, Kubelík (DG2) would be my Desert Island selection – but the aim of the Antal Doráti Centenary society is to preserve his recordings and, taken as such rather than searching for a top recommendation, I very much enjoyed it. In fact there’s nothing at all that tempted me to get out my red pen. If I say that there’s nothing that particularly made me sit up and take notice, either, that’s not meant as a criticism: it’s equally true of Kubelík, one of whose strengths is that he characteristically gives us Dvořák fairly straight. It’s clear that both the Berlin Philharmonic for Kubelík and the RPO for Doráti are enjoying the music as much as their respective conductors, even though I don’t think that Doráti made too many recordings with this orchestra. I presume that the Dvořák recording was made by Decca engineers – the Kingsway Hall was their stamping ground and the Turnabout label was licensed to Decca at the time. Whether that is the case or not, the recorded sound is fuller than in the Tchaikovsky. Presentation is fairly minimal, without even the diacresis and accent for Dvořák, though Doráti is printed with the ‘á’ throughout.3 The simple booklet merely lists movements and timings – no overall timing for each work – the orchestras involved, the date and place of recording and, for the Tchaikovsky, the catalogue numbers (mono and stereo) of the first US release4. My review copy came in a paper sleeve, with a simple pair of inserts for use with one’s own CD case – these are post-free at a very reasonable £8/€10/$10 each. That’s a very sensible arrangement: it allowed me to place just the CD and ‘booklet’ in a slim-line case to save space. Only for CDs in jewel cases is there postage to pay. This well-filled and enjoyable CD marked my first encounter with The Doráti Edition and I hope that it won’t be my last – there seem to be some tempting releases in their collection with higher catalogue numbers in the offing. 1 CD or download from prestoclassical.co.uk. Also sample/stream/download with pdf booklet from Qobuz. Please see Göran Forsling’s review of the SACD reissue. I listened to the Qobuz as I was completing this review and enjoyed hearing the Nutcracker again, but I’d still choose Ansermet for my Desert Island (Australian Decca Eloquence 4800557, with Suites 3-4 or Brilliant Classics 94031, with Sleeping Beauty, Swan Lake, etc.). 2 Symphonies 8 and 9 on DG Originals 4474122, or Nos. 6-9 on DG Duo 4779764, or Nos. 1-9 on DG Collector’s Edition 4631582. 3 Incidentally, a cause of confusion: Doráti eventually gave up reminding people that the accent was a mark of a long vowel – as in father – rather than of stress, which should fall on the first syllable. 4 MMA11091 and AMS16040 in the UK.